Here's the difference. There were 200-foot flames in San Francisco (sic), and you know what, the fire did not pulverize the concrete into dust. It also didn't fall symetrically into its own imprint (sic) beneath, and it also did not fall at free-fall speed (sic). I think that's close enough to its own footprint, Rosie. Don't know whether it collapsed at free-fall speed, but I'm certain it was quite sudden. The concrete dustification crap really seems to be catching on, although of course it has nothing to do with World Trade Center 7. "I'm not going to apologize for questioning whether or not it is possible, through the laws of physics, for World Trade Center 7 to have fallen the way it did. And I also would like to know why it was left out of the 9-11 [Commission] Report. That's very interesting. And a bridge is a lot different than a 47-story office building with 25 internal steel columns." This is of course an evasion. Part of her earlier claim was that fire could not melt steel (a ridiculous notion), and now she's trying to ignore the rather obvious fact not that the steel melted, but that it weakened enough that it could not hold up the bridge, the same thing that happened in WTC-7. Note that the junior hens nod as if Rosie were dropping pearls of wisdom on us all. Actually the impressive part was when the gal in the back claimed that during her college days she could chug a beer in three seconds. Hat Tip: Hot Air, where our buddy AllahPundit is apparently enjoying a well-deserved vacation, the slacker! 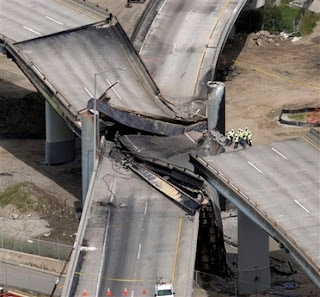 Heat from the flames exceeded 2,750 degrees and caused the steel beams holding up the interchange from eastbound I-80 to eastbound Interstate 580 above to buckle and bolts holding the structure together to melt, leading to the collapse, California Department of Transportation director Will Kempton said. I wonder if that's not just a preliminary conclusion based on the 2750 degree melting point of steel and the assumption that the steel actually melted. Anybody seen any photos indicating it actually melted? Update: Here's a video of the collapse. As you can see, once it breaks free, it falls very, very quickly and does not appear to slow at all when it hits the lower roadway, bursting through that as well. So to sum it up, gasoline fire sufficiently weakens steel to the point where it can no longer support the steel structure, and it gives way at an acceleration that certainly seems to be nearly free fall. But Ro still thinks she's right? With the verdict, however, comes fresh revelations about the full extent of MI5's knowledge about the July 7 suicide bombers. It can now be disclosed that Khyam met Mohammed Siddique Khan, the leader of the 7/7 plotters, at least four times in England while under MI5 surveillance but the link between them was never properly followed up. The two met each other at least four times in England while Khyam was under surveillance by MI5 in the final stages of his plotting. At one point they were even recorded by Security Service agents talking about terrorism. Khyam also met another of the 7/7 suicide gang - Khan’s right-hand man, Shehzad Tanweer - while under surveillance by MI5. Yet despite this, neither Khan or Tanweer were classified as priority targets by the Security Service. Graham Foulkes, who lost his 22-year-old son David on July 7, said that when he learned of the truth about 7/7 he was "absolutely overwhelmed with a sense of sheer disbelief". A tragic mistake, of course, and we have little doubt that the 7/7 and 9/11 kooks will jump all over this. We are also told by Port Authority officials, that the building over there, which is building number 7, which you can see... it is building number 7 it is oh, I would say a 20 story building. That there is some concern on the part of Port Authority officials about the stability of that building at this point. So obviously, as we have been discussing all day, a very very difficult circumstance here as to exactly when that area is going to be truely secure. Amazingly, they are using this as proof that the building was not damaged enough, and the fires were not severe enough to cause a collapse. I guess the Port Authority is in on it too. “They had to do this. People were getting too close. First it was ‘Loose Change‘ with the realization that the ‘hijackers’ could have been pimp-slapped at any time. We tried to counter that by forcing Popular Mechanics to publish an issue debunking the 9/11 conspiracy theories, but we didn’t count on the internet and the fact that there are a lot of guys out there with time, chicken wire, and cups filled with lighter fluid ready to counter anything we could get published. We barely managed to downplay the Charlie Sheen fiasco, and we glossed over the near subliminal messages conveying the truth in ‘Shooter‘, but when Rosie O’Donnell went public with the fact that this is the ‘first time fire has ever melted steel‘ we knew we were screwed. Even our surreptitious placing of Elisabeth Hasselbeck as the only attractive female on the panel couldn’t draw attention away from that. Lord knows, I thought Dylan was insensitive, but this guy makes him look like Richard Simmons. David L. Griscom, a retired research physicist, has come up with his own rather unique theory. Yep, that's right, this toad believes that all the passengers were paid off. Todd Beamer and Jeremy Glick are probably sipping Pina Coladas on Tahiti right now. Simply disgusting! Update: PDoh in the comments: Hey if someone offered me 10 million quid to disappear to some tropical paradise and relax on a beach all day with fit women I would take it. Perhaps you are missing what they would really have been given the 10 million pounds for; complicity in the murder of thousands of people. Then again, maybe this is why the "Truthers" are so easily convinced? After all they'd take the money if it were offered to them. He's also a 2004 Election kook, which confirms my already low opinion of Fitrakis, Freeman and their ilk. The candidate for the other 84% of America! Unfortunately, we know one McKnight Professor who won't be voting the Gold ticket. Interesting article but I've got to put it on major honking huge flashing yellow light alert as well. Al Qaeda-linked plotters hoped to reproduce the Sept 11, 2001 attacks by planning to dispatch suicide pilots to military bases and launching attacks on the oil refineries that drive the economy of Osama bin Laden's homeland, Saudi Arabian officials said Saturday. Revealing new details of the purported plot, a government spokesman said some of the 172 attackers trained as pilots in an unidentified 'troubled country' nearby, hoping to use the planes to carry out suicide attacks. If true this is huge news, but I am absolutely not ready to buy it based on one potentially biased source. Yellow light but definitely read! I have been shaking my head reading the comments over at 911 Blogger. My favorite was the guy who feared that Barrett might have his exit visa revoked by the US government. Huh? I have travelled abroad maybe a dozen times in my life, and I have never needed an exit visa. Where do you even apply for those? 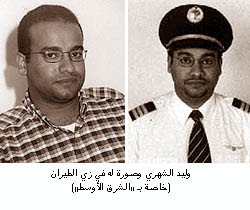 Anyway, the conspiracy theorists of course fail to notice even a single problem with any of their theories, so I thought I would point everyone to this excellent series of articles done by 911 Myths on the subject, where they point out the fact that the photo where the airline pilot Walid Al-Shehri matches the photo used by CNN, but does not match the photo used by the FBI, in fact CNN manages to get the name wrong too. The CNN broadcast which caused the confusion. They get the right Waleed, but the wrong Wail. The airline pilot Waleed, who CNN misidentifies as Wail. This is the guy who Barrett is apparently going to interview. 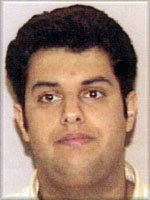 The hijacker and Saudi citizen, Waleed, as identified by the FBI. This guy is clearly not the airline pilot, although I suppose Barrett will probably overcome this difficulty by ignoring the FBI photograph and go with the incorrectly identified CNN one. Now I have to commend a member of the 9/11 "truth" movement for finally doing something beyond watching blurry YouTube videos, but that still does not excuse bogus investigations. Barrett cannot even bother to get the most basic facts right. He says the Saudi Waleed that the FBI identified could not have been part of the plot because he didn't speak English well. 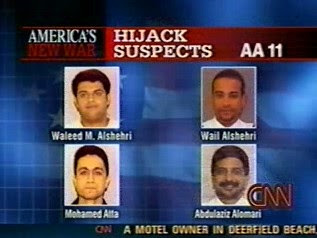 But the real Waleed was not a pilot, the pilot for AA11 was Mohammed Atta. Waleed was just the "muscle". How much English do you have to speak to stab a flight attendent in the neck? Kevin, this is a great idea... but don't tell everyone your plans in detail! Come on people. We have to be more careful. Don't we all come here to Blogger first thing each morning? No upcoming actions of this sort should be announced in advance. You guys need to realize that we are endangering both of these people's lives. This is not something to brag about, yet. What if something happens to them?! They will then make it seem like an accident. Come on! Please. Am I rational here? If you're this concerned--and you could be right--, then click the "contact us" under our logo and email any of the mods. They might not see your post in a timely fashion. This sort of reveals the flaw in Barrett's decision to become the funnyman of 9-11 Denial. Heheh, one of the main reasons I'm blogging this is because I couldn't resist that title. Apparently Luke Rudkowski now wants to sue the security guard and the security company that got him busted at a WTC 7 protest. The "evidence" consists of a video that Luke and others recorded. One of the guards can clearly be heard saying that he thinks he saw wires sticking out of Luke's backpack, and he thinks Luke looks like a terrorist. It's an amusing bit which won the NY Deniers $1,000 from Mark Dice and it certainly appears that the guard was having a little fun getting Luke busted. But he's also smart enough to say that "I think" x rather than make a direct claim. And apparently, contrary to the security guard's prediction, Luke does not actually spend 30 days in jail; he is detained for about an hour. So that's $1,000 an hour. It's hard to dislike Luke. He's earnest and committed. Of course I am probably doing him no favors by saying that. 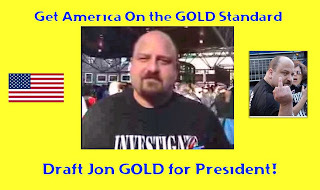 Did I mention my personal admiration for Jon Gold? Create your own comic strip here. Update: See also A History of Alex Jones' thought. Lots and lots of 9-11 debunking cartoons here, which is of course where I got the idea. Update II: Ain't it The Truth! Another terrific effort by our buddy Boloboffin! Update: 9-11 Truthiness has some more video of the North Tower hitting WTC 7. 1) the fire: Jet fuel burns at a max of 1300f in open fire.. the jetfuel burned up in about 15 mins.. Steel doesn't soften until it reaches 600c. 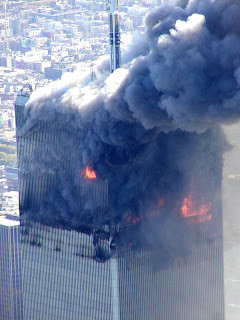 the fire never averaged over 800f considering it was oxygen starved due to all the black smoke. Black smoke could be indicative of an oxygen-starved fire, but it could also indicate other things. Plastics commonly burn with a very dark smoke, and the average office is filled with plastic items. The fire was never very large considering it never went beyond its point of origin. According to physics.. It's impossible for that fire to have done any structure damage at all..muchless melt steel or iron that doesn't melt until 2800f. Thats 2000 degrees above the average temp. Even if the fires burned at 1300f for 3 hours it would not have done any damage to the steel structure muchless the core of the towers. Then why, oh, why, do they fireproof steel? If they only knew what you know, they could save themselves a lot of money! 2)No failing structure can crush or pulverize its self into 60micron dust particles.. 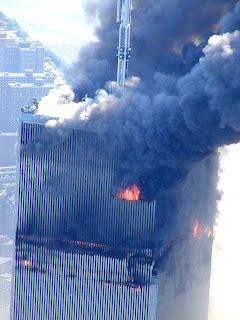 The building was in a free fall..Free fall means Zero resistance from the structure below the failure.. With zero resistance there is no resistance or force great enough to create the conditions for the pulverizing of 80percent of the steel reinforced concrete within those towers..
See all that debris around the building? It's clearly falling faster than the building itself. So either you think the debris is falling faster than free fall, or the building is falling slower. You would need massive lower structure resistance with equal or greater down force to create the pressure needed to pulverize the buidling to dust.. Since the buildings gave at free fall speeds..this means the lower structure gave before the down force of the structure above could make contact.. Knowing the laws of physics..The buildings could only have been professionally demolitioned.. Only explosive charges set to take out the lower structure before the above structure could make contact could have made the buildings fall at free or near free fall speeds.. You can't argue physics.. the pancake theory is BS! the Fire Theory is BS! The building did not fall forever; it did meet resistance it could not match in the earth. And surprise, surprise, we got a big dust cloud. As for your professionally demolitioned (sic), can you show us some other examples of top down professional demolitions? For some odd reason, every one that I see starts at the bottom. also note.. For a building to come straight down into its foot print would mean that all 4 sides of the structure would have to give all at the the exact time and rate of speed on every floor.. Otherwise the building topples over.. But of course the buildings did not come down straight into their footprints. I believe the current estimate is that they came down into an area 16 times their footprints. And the collapse of the South Tower reveals the fallacy in your argument of toppling. 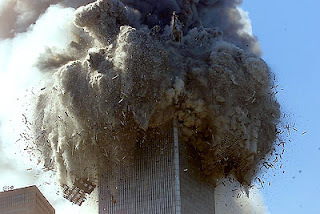 The building did start to topple, but as it did it put extra stress on the remaining columns, causing them to give way. There is no way in hell that Two 110 story buildings with drastically different structure damage due to un-identical impacts of two different planes could both come down in the exact same way while defying physics.. The buildings did not come down in the exact same way; you have done some research on this topic and aren't just cut and pasting from somewhere are you? The South Tower started to topple as we would expect, given its asymetrical damage, while the North Tower came straight down as you can see in any of the collapse videos, since the radio tower remains pointing up. The pancake theory also leads you to believe the fires burned at a constant 1300f or more exactly evenly over the entire massive structure on all 4 sides.. The pancake theory isn't current. 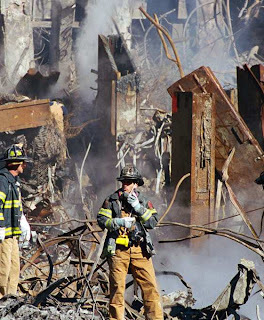 You do know what NIST attributes the collapse of the towers to, don't you? BS!Steel and iron conduct heat very well and disperse it through out the entire frame.. steel temps were no more than 430f max at the hottest point.. and the entire steel frame would have much cooler areas..Meaning there is no way in hell the towers gave ghost exactly on all 4 sides and the exact same time and speed. Vertical load.. You could have put tower 1 on top of tower 2 and not have had a collapse.. The core of each building had a max veritical load of twice the actual structures vertical weight. Each floor can hold up to 10x's its load.. Simple facts that are left out of the pancake theory.. and the fact that you are pulverizing steel reinforced concrete would require 10x the kinetic vertical energy with equal or greater resistance from the lower structure.. Which is impossible even if you dropped tower 1 on tower 2 without explosives.. 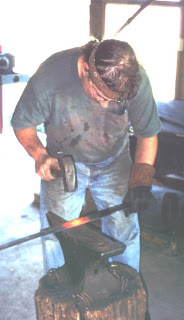 The heat sink argument is nutty, as anybody who's ever observed a blacksmith knows. One part of a piece of steel can be red-hot while a few inches away it maintains its normal color. According to William, I guess this photo is impossible, since the heat should dissipate instantly? The Irish 9-11 Denier and political candidate reflects on the South Park Episode (one of the definite high moments of debunking history). "But there must have been some motive. Nobody would just dook in the urinal for no reason." Officer responds "But who would benefit from crapping in the urinal?" Cui Bono indeed. The problem with decoding 9/11 information however is considerably more complex. Due to the ‘controversial’ nature of the topic and the fact that individuals have lost jobs, careers, husbands, wives, kids, money, power, influence (the list goes on) when they have spoken to the truth of 9/11, anybody who wishes to do so is inevitably given serious pause for thought. 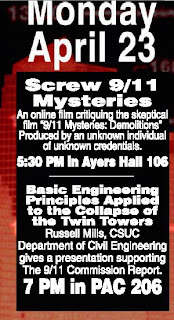 This has led to the phenomenon of people writing articles on the 9/11 conspiracy that are overt dismissals of the topic, but which contain a wealth of information, and that are couched in such a way that the average non-informed reader will come away with a series of questions and/or revelations. This is despite the same writers dismissing 'conspiracy theories' in the same articles. It has happened so often in the MSM that I have lost count – I won't include any example here for fear of drawing attention to people that are essentially on 'our' side. BTW, if you haven't seen the South Park episode, there's a Windows Media file of it at that link. Brzezinski is reportedly refraining from accusing the administration of actually aiding the Al Qaeda attacks. Instead, sources say, he claims that a "cabal" of high-level officials knew or strongly suspected that a major terrorist attack was likely to occur but did nothing to stop it in order to create a pretext for an endless war abroad and police-state-like powers at home. At 79, Brzezinski is no stranger to foreign adventures and intrigue. A veteran Israel-basher, the Polish-born political scientiist was primrily responsible for the Carter administration's pro-Islamist policy--a revamped version of late 19th century British attempts to harness militant, fundamentalist Islam in the Crown's competition with Czarist Russia (known as the Great Game). A plausible scenario for a military collision with Iran involves Iraqi failure to meet the benchmarks; followed by accusations of Iranian responsibility for the failure; then by some provocation in Iraq or a terrorist act in the U.S. blamed on Iran; culminating in a “defensive” U.S. military action against Iran that plunges a lonely America into a spreading and deepening quagmire eventually ranging across Iraq, Iran, Afghanistan, and Pakistan. Obviously yellow light on this one. Starts with WTC 7 which of course is one of my favorite topics. Gravy gets off a devastating bit about "bombs and explosions". Overall, Fetzer managed to dodge a lot of obvious problem punches. He got away with dominating the conversation. Fetzer does have some skills at debating conspiracy theories and compared to the Loosers and Les Jamieson, he acquits himself well. I want to emphasize that is largely due to Fetzer's slipperyness, not to any superiority of fact. Mark Roberts didn't fatten his average against Uncle Fetzer because you cannot improve on 1.000. Once again Roberts surprised me with his breadth of knowledge, as did Ron. Gary Frenchi: You know those guys, I guess… at the Screw Loose Change blog, they came out and said that they were plotting against you guys. They got exposed too, you know we're exposing everyone who is trying to expose 9/11 truth. I am still trying to figure out what exactly he meant by that. Perhaps he still thinks the fake Pat is real? And after watching Jason Bermas running around in his underwear in one of their vanity films, I really don't want them exposing anything. Bermas: It is going to be interesting to see what kind of an audience we are going to reach, outside of what we already have. I mean is this thing going to spill over, to where we are going to have people on the streets immediately? Are we going to have an independent inquiry demanded by the people? I mean is there going to be mob rule? Is this thing going to be banned in some states? It is a rollercoaster ride waiting to happen, Gary. I wish I had all the answers. Well I just want to encourage people to go out and do their own thing man. People like you, myself, and others have really been able to change the lives of millions of people across the world. Maybe he should start doing late night infomercials? "Do you want to change your life? Call now 1-800-LOO-SERS"
I got an answer later that day from Kerry's press secretary Amy Brundage via e-mail that, "The only comment we've got for you is that of course the Senator would never say that." The 9/11 conspiracy movement is basically a religion, with folks looking for Christ's bearded mug in a taco shell. Ridicule is helpful, I think, in preventing others from going to sleep with the pod beside their beds. I don't know if it does any good, though, once the body snatchers have already replicated. BTW, I've been meaning to get around to doing a review of Hicks' book, The Big Wedding. I'll try to do it some justice later, but Hicks' big problem is that he trusts too many shady characters like Delmart Vreeland, Randy Glass, Daniel Hopsicker, and of course James' favorite, Ambassador Leo Wanta, the wealthiest man in the world. If you're skeptical about the official story, but find Wanta credible, I've gotta wonder whether your BS detector is a little faulty. I Have Been "Peer Reviewed"
"The above paragraph... Was sent to me by Steven Jones. If you have a problem with the wording, feel free to contact him. I posted it because he sent it to me." Unbelievable. I wonder if I can put this in my C.V.
Can be seen here. I'll add comments as I watch the video. Update: Some very nice bits in there. I love it when Fetzer (18:30) was claiming that the bodies still strapped into their seats was a "nice story" and Mark corrected him saying it was a horrible story, and it happened to real people. Lyte Trip will be pleased to hear that Uncle Fetzer has witnesses (22:25) who reported seeing the plane fly over the building. Officially, the reason is that they couldn't match Rosie's salary demands. The president of daytime programming for the Disney-ABC Television Group, Brian Frons, told ABCNEWS.com, "Going in we knew we would have an amazing year with her, and that anything beyond that would be gravy. But we were willing to take the chance because we understood what a coup it was to entice Ro back to daytime television. So here we are a year later, and while we've tried to come to terms on a deal that would extend her co-hosting duties on 'The View,' we find ourselves unable to agree on some key elements." I'll confess, I thought they were going to bring her back on the theory that controversy sells. I guess Barbara Walters wants to maintain some credibility as a journalist. 75% of my content, up in smoke. I’m a wreck. Assuming it’s true, what do you think — did she jump or was she pushed? And if the latter, why did Barbara push her? I've never seen the show, and I don't really get what the fuss is all about with her, but she's been making the news a lot lately, so I thought I'd report it. The View is losing its best asset, as rumors that Rosie O'Donnell is leaving the show are true. O'Donnell and ABC couldn't come to terms on a new contract, so she'll leave in mid-June. It's time for Rosie O'Donnell to update her resume and post it, fittingly, on Monster.com. Answer my question! You are scum, sir! Huge entertainment value, especially the part where Luke runs from the security guys. Steven Jones replied to the e-mail I sent him with some follow-up questions to complain about the mocking tone of my questions, particularly my "time travel" comment. One of the commenters here brought up the issue too, so I figured I should address it. I already explained this to Jones. I was actually going to change that sentence, not so much because I am morally opposed to sarcasm, but because my point was unclear, but I forgot to. The point I was trying to make was how the sourcing of the papers at his "journal" is inconsistent with normal standards. Jones claimed that knowledge of these devices was widespread, but his only "academic" citation was a paper written, by no coincidence, in his own journal after he published his original paper. The paper he was citing, incidently, was not written by an expert in the field of demolitions, but by a lawyer. Research has shown that the primary driver of option value is the volatility of the underlying asset [Scholes, 1973], although the propensity to accept risk is also an important factor [Miller 2003]. With the footnotes referring to other academic works which have also gone through a review process and been generally accepted by experts in the field as authoritative. Occasionally they may also cite some other authority, such as a government report, or an article in an established media source. You don't just leave your claim freestanding, and then try and come up with justification for it after the fact though. Not so for the "scholars" though. They will cite anything, from any source, under any circumstances. Often they will just cite something they don't even understand in hopes that will work out for them eventually. One common technique is just to pretend something is commonly accepted and understood, so they don't have to provide a reference for it. That technique will work for claims such as "Canada is located in North America", but for far out claims such as "Thermite is commonly used in building demolitions" or "The Pentagon is surrounded by automated anti-aircraft guns", it is bogus. Not to mention their habit of citing such ridiculous sources as unsourced photos, photos which don't represent what they claim it does, neo-Nazi newspapers, websites set up by people with no particular authority, or YouTube videos of unknown origin. I am not saying that you can never source stuff from the Internet, I do all the time, but I don't claim that this is a "peer reviewed" blog, representing the highest in academic standards either. What I do find astonishing is that several web sites that have posted that President Bush was directly involved in the 9/11 attacks would post this article on their sites, CIA told of al-Qaeda hijack plot before 9/11. This article reports, “FRENCH intelligence services warned their US counterparts, eight months before the attacks of September 11, 2001, that al-Qaeda was planning to hijack a US-bound plane, a media report said today.” It goes onto say, “Le Monde said the document, titled "Aircaft hijack plan by radical Islamists," was part of 328 pages of a DGSE file on al-Qaeda leaked to the paper which it said was practically the entirety of the French intelligence services' dossier on the network.” Do these sites believe the conspiracy or the ignoring of terrorist threats? That is where critical thinking comes into play. Exactly. 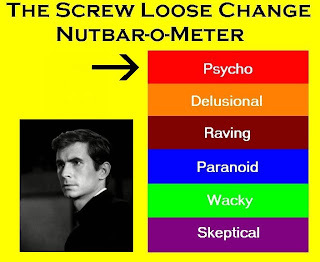 These folks seize on anything they perceive as negative to Bush, regardless of whether it makes sense with the conspiracy theory that they are claiming. They are like pack rats gathering up anything shiny. "See! Bush got a warning! Therefore he must have done it!" Which raises the obvious question: What were the French warning him? Were they warning him of a surprise attack by Al Qaeda terrorists, or were they warning him that the PNAC was plotting their new Pearl Harbor? If it's the former, then it doesn't fit the MIHOP theory at all. Folks, you are free to believe what you will of 9/11 whether or not the government was behind it. But, what I am asking is that any article that comes across your monitor stating that the government was behind 9/11 is to use critical thinking. Do not automatically believe in your angst against this administration that every article that says President Bush did it is true. To be honest, at one time I believed these theories. It was only through critical thinking and searching out what others of a differing opinion had to say that changed my mind. And no, I am not a collaborator, but a writer who has consistently written negative articles targeted at George W. Bush. At the end of our previous correspondence, you invited me to ask follow up questions. These are the immediate questions I have regarding you responses. These are certainly not all the questions I have, but as I have a difficult enough time getting a clear answer on these subjects, I will try and limit myself to the key points. First of all, I would like to readdress the infamous “angle cut” picture that you repeatedly use. First of all, you admitted this photo was the “subject of much discussion”, and then stated that “the metal-cutting device employing thermite is well known and documented”. First of all, on what basis do you call this completely unnamed device “well known and documented”, when it has never been used in building demolitions, and the sole reference you can find for it is a paper in your own journal, 4 months after the paper which we are discussing. Do academic papers now employ the use of time travel devices for their footnotes? How in the world, under any reasonable definition, can this be considered “well known and documented”? Regardless, you completely avoid the key question, which is why should one believe that this angle cut was created through the use of this entirely speculative thermite device, when the overwhelming evidence points to the use of acetylene torches? I am no scientist, but I am fairly aware of the scientific process, which involves coming up with the most likely hypothesis, and then trying to prove it right or wrong through experimentation and analysis. In this case we have the use of torches, which have been used by millions of ironworkers over the last century, which were known to be used at ground zero, and which produce angle cuts exactly like the one in question. None of this is open to dispute. On the other hand we have “thermite” devices, which even 5 years later have never been used in building demolitions, are not commercially available, do not produce straight angle cuts like those in question, and cannot be demonstrated to be able to produce such a cut. So why exactly do you skip past the most obvious explanation, and speculate on the explanation which is least likely to be true? This is Occam’s Razor, in reverse. If you look at the size of this device in your example, and then scale it out to one of the massive WTC columns, it becomes quite apparent that for just one column you would require a number of devices approaching the size of a small refrigerator, weighing hundreds of pounds, and requiring 360 degree unobstructed access to these columns. Please explain to me how it would even be possible, much less likely, for the “covert demolition teams”, to get uninhibited access to hundreds of these core columns in a highly secure and occupied office building, to install these absolutely massive devices, so that they can attach them, all without anyone noticing. Also please explain how none of these hundreds, if not thousands, of what would surely be distinctive looking devices, which by their very nature would have to be built to withstand tremendous pressure and temperature, were not found in the wreckage of the World Trade Center, by any of the hundreds of firefighters, police officers, iron workers, FBI agents, and various other investigators who were involved in the cleanup. In fact, why is one of these devices not shown in the photo you are using? They should be attached to that very column. Why would these conspirators use such a complicated device, knowing that it could easily be discovered in the aftermath? After you explain all of this, please explain why all of that is the more likely hypothesis, than simply accepting that the column was cut with an oxyacetylene torch, like the hundreds of other columns which are known to have been cut using these torches? As far as question #3, addressing the photo of pancaked floors on display in a New York hanger, I cannot really ask any follow-up questions, since you never answered the question in the first place. All you responded with was the fact that Janette MacKinlay took the photo. Unless Ms. MacKinlay, and not you, is responsible for the assertions in your paper, I couldn’t care less who took this picture. Do you disagree with the fact that this picture is not of molten iron, but rather “actually several floors of the towers compressed together as the buildings collapsed”? If not, then how do you explain that once again you have misrepresented photographic evidence without making appropriate efforts to determine its origin? As regarding the lack of standards at your “journal”, you also avoided the key question, which is, is there a conflict of interest having your paper published by the journal you founded, and an editor who owes his position to you, and who is a prominent source for the paper in the first place? Your only response was to express the fact that you apparently were satisfied with the performance of Mr. Ryan. This was not up for dispute; in fact I would be willing to bet that you are ecstatic with his performance. That is the point. I would also be willing to bet that had Mr. Ryan coordinated a critical review process which led to serious challenge, or rejection of the findings of your paper, which were significantly based on the findings of Mr. Ryan himself, that you would be extremely dissatisfied with his behavior. In fact, that could potentially lead to the end of the journal entirely. That is why it is called a conflict of interest. What possible reason could Mr. Ryan have for ensuring a rigorous academic review of your paper? In fact he would have every motivation to ensure this absolutely did not occur. This is not a criticism of Mr. Ryan, I am merely pointing out the ridiculous nature of this arrangement, which to my knowledge is entirely out of the bounds of accepted academic standards. On 16th April, we had another diversion, timed to coincide with Wantagate, in the form of the ‘Manchurian Candidate’ operation, riddled with ‘extraordinary’ anomalies, in which a ‘Monarch slave’ student murdered the geomasonically precise number of 32 victims, including a renowned Jewish Professor of Romanian background – before turning his gun on himself, to ‘complete’ the esoteric numeral of 33 deaths. The gunman, subsequently identified as 23-year-old Virginia Tech senior Cho Seung-Hui, of Korean extraction, took care to shoot each of his victims THREE times, and here’s why. Without going into any detail here about Luciferian mind-control programming practice (of Luciferian, Himmlerian, Tavistock Institute and Jesuit Illuminati origin in the modern context), it is a fact that Omega mind programming controlled inter alia by an Executive Control Board (Grand Druid Council) uses numeric codes for gaining forced access to traumatised and pre-programmed controlled ‘slave’ operatives within which the ‘trigger’ numeric code prompting the controlled operative-victim to commit murder is 3221456. Note that the first two numbers coincide with the number of Cho’s victims. The universal programming code for access to the ‘programmed internal computers’ of these intelligence sector controlled Monarch ‘slaves’ is 33123113211. Note also that the first two numerals coincide with the ‘completed’ number of dead, including the mass murderer himself, as well as 'triggering' him to shoot each victim THREE times. George Bush Sr., former Director of Central Intelligence and head of Deutsche Verteidigungs Dienst in succession to Dr Henry Kissinger and Admiral Canaris (Samuel Randall Pittmann), ‘was’ a Monarch ‘slave’ handler. 1. An abominable atrocity has been preplanned to coincide with the US Republican National Convention in the Twin Cities of Minneapolis-St Paul on 1st September 2008. 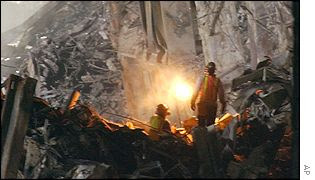 Such atrocities are typically prepared many years in advance: for instance, operatives associated with the bombing of the Murrah Building in Oklahoma City revealed their foreknowledge of the 9/11 attacks back in 1995. 2. The purpose of the planned abomination in the Twin Cities on the next ‘9/11’ will have been to scrap the US Constitution and to install the intended (Nazi) dictatorship, in conformity with the long-range strategy pursued by Deutsche Verteidigungs Dienst (DVD), based at Dachau, the Black ‘Nazi Continuum’ counterintelligence strategic centre, to ‘Build the Thousand-Year Reich on the Ruins of the United States’ – as exposed in documents from the Madrid-based German Geopolitical Centre captured after World War II and reported by this service in earlier postings on this website. 3. Following exposure here of this intended crime against humanity, we have every expectation that this diabolical ‘Reichstag Fire to end all Reichstag Fires’ will be/has been aborted. Conveniently, the author cannot be wrong, because he has both predicted the attack, and the fact that he will prevent the attack! 2001: After 70 years of existence, Enron is revealed as a giant corporate shell game. Billions of dollars go missing and the retirements of countless millions of Americans are wiped out, thus ensuring longer working careers and reduced public confidence in the federal government. Sarbanes-Oxley is drafted to reduce the power of the business sector, viewed as a threat by the Cabal. 2001: Using funds from the Enron collapse, the Cabal plants explosive devices in the World Trade Center using the well-known techniques of destroying 100-storey buildings. These are detonated so as to minimize loss of life, and advanced holographic projectors fool the populace of NY into believing that two planes struck the towers. A second controlled explosion in Washington convinces people that this is part of an attack by a previously-unknown group of ragtag terrorists. In fact, three planeloads of people were taken to an orbital base to provide genetic material for advanced bio-manipulation experiments. A fourth plane, which crashed in Pennsylvania, is a fortuitous coincidence that the evil Cabal capitalizes on. Hat Tip: Carnival of Satire. 2. Don't imitate other people with your screen name. I will allow some latitude on this (for example, MurderVillage is okay even though it's an obvious takeoff on Killtown), but I will delete comments where the name is too similar or is just another person's name/nick with an insult attached. There has been far too much "Blog Fakery" going on lately. 3. Don't give out any detailed personal information on yourself or other people. It's okay to say, "I'm a pilot," it's not okay to say, "My phone number is 503-266-####." 4. Don't attack the posters or other commenters, attack our (and their) arguments. For now I'm being pretty lenient in interpreting what is an attack. 5. Don't put excessive links in the comments. I appreciate people like BG and Nico who occasionally put a link in our comments, but I don't like five link comments in a row, as BG has occasionally been guilty of. 6. Don't threaten posters or commenters no matter how provoked you may feel. We reserve the right to add to or amend these rules at any time without prior warning. Repeated violations of these rules may result in IP banning. By wall I believe he is referring to the slurry wall, aka the Bathtub. I also think the building that he's commenting about is actually WTC 6, which was pulled (down) a couple weeks later. Kerry was simply stammering and said what he could to sound like he knew what they were talking about. Update: That's what I get for not checking whether my co-blogger has covered this already! Of course it is almost a truism of the 9/11 "truth" movement that the perpetrators will give away the plot with a slip of the tongue at opportune times, just ask Larry Silverstein. The latest example of this is John Kerry, at a book signing in Austin, in which he repeatedly gets asked about all sorts of theories, including chemtrails and building 7. Kerry, of course, nods and smiles politely while conspiracy theorists drone on with their paranoid question, but then in regards to a question on building 7 and as to whether Larry Silverstein had been investigated, he lets the "truth" slip". I do know that, that wall was in danger, and they made a decision based on that danger, that it had of destroying other things that they did it in a controlled fashion. I am not sure what exactly Kerry is talking about, this is the guy after all who is still confused as to whether he spent Christmas in Cambodia. Most likely he is just referring to the clean up efforts, where they were worried about damaging the slurry wall while taking down the remains of the buildings. Of course in truther logic, politicians and businessmen never just get confused or misstate something, it is always just some secret knowledge they have. I guess Kerry learned this from those Skull & Bones meetings. It took place in Brooklyn, so I suppose we could call it the Flatbush Flattening? Round one to Mark Roberts. Now we understand what he meant when he said he felt like an altar boy after the debate! Kudos also to Ron Wieck, the host, who cuts to the chase quite effectively. I discovered that you can download Bermas' and Avery's show from the Usenet Newsgroup alt.binaries.sounds.radio.misc rather than getting up at 7:00 in the morning (my time) to listen to his ramblings. The commercials have been snipped out, although unfortunately, the overlong musical bumps to begin each segment have not. Yesterday Bermas gave us some insight into his political thoughts, which, if anything, are even more poorly informed than his 9-11 thoughts. "It'll split us into two, and instead of, you know, Ron Paul getting 30 or 35% of the vote in the (Republican) primary, it may be down to 15 or 20, because the other half is voting for Kucinich, in the Democratic Primary." I'll make a deal with you, Jason. I'll donate $1000 to the charity of your choice for every percentage point Ron Paul gets above 15% in the Republican primaries, if you agree to donate $1000 to the charity of my choice for every percentage point Ron Paul gets below 15% in the Republican primaries. In fact, Ron Paul will get 1-2% of the vote in the Republican primaries; essentially the kook libertarian vote. I listened to most of the show. Avery and Bermas are now talking about a big announcement 60 days down the road, not imminent as Dylan was claiming last week. We hear that "we might be seeing a trailer" with Remo Conscious' new (c)rap song on it. There's a hint that the Cuban Deal may have gone south. Bermas is talking about Mark Cuban and says something along the lines of "Look at all the flak Cuban took from ESPN.com and sports blogs, and I don't think Cuban even wants to be bothered with this...." Unfortunately at that point they go to a commercial. "He didn't agree with all of it, and really nobody should agree with all of it, and no one really does agree with all of it...."
"In the late 1800s, before he was president, McKinley bombed his own ship, the Maine, blamed it on the Spanish, Hearst Publications published all these lies, there was a song called 'Remember the Maine', and through massive indignation we were able to bear arms against the Spanish." The usual sterling job by the crack researcher of the Louder than Words Crew. In fact, McKinley was never the captain of the Maine (he was in the Army during the Civil War, but afterwards became a lawyer and politician), the sinking of the Maine took place in Havana harbor (i.e., not within the United States), it happened during McKinley's term as president, and while there has certainly been some speculation that the explosion (which killed 266 US sailors) was somehow an "inside job" this is undercut by the fact that McKinley opposed the Spanish-American war until public pressure became too great. In fact, McKinley did not even cite the Maine in calling for US intervention in the Cuban civil war (which led to the Spanish declaring war on the US). But aside from that, Bermas is 100% correct; the Hearst papers did agitate for war, and there was a popular song called Remember the Maine. "And if you're not killed in Iraq, aka you're blown up and then you're flown to a military hospital in Syria or Pakistan or along the border somewhere and you die, you don't count as a casualty of the Iraq War. You died somewhere else, and they don't give us that number." So now we have military hospitals in Syria? Uh, am I missing something here? This guy is not even LIHOP. Criminal negligence? And for the record, I would love to see Osama captured or killed. Hey, man, I thought I had caught him at the shopping mall this afternoon but he wriggled free. And Osama is not the mastermind of 9-11; that's KSM. Bin Laden provided the muscle hijackers and the money. Okay, so now we're back on Osama didn't do it? What the heck is wrong with Herman--was he drunk when he wrote this? One of the sillier theories that the 9/11 conspiracy theorists put forward, most recently suggested by Rosie O'Donnell on her blog, is that WTC 7 was demolished to destroy Enron documents. This makes little sense, but they have to create some reason to explain why the conspirators would go to so much trouble to blow up a building that most people did not notice anyway, and then immediately rebuild it. This theory is most ridiculous in light of the fact, that just about every top Enron executive was convicted and sent to jail. The Wall Street Journal has an interesting article on one of them today for those of you who subscribe. What is the world coming to when you go to all the trouble to covertly rig a 47 story building for demolition, and you can't even keep a few accountants out of jail? You all seem to be oblivious or intentionally obtuse, even to the point that you will not accept a "truther" point that the towers were composed of steel reinforced concrete. Of course with a tower structure of this height/base ratio it is almost required that the frame be constructed of steel beams, but the bulk of the building, all of those open spans like ceilings/floors, walls, those are constructed of steel reinforced concrete, as I stated earlier, not just concrete. I have some grave doubts as to whether this guy has any real involvement in structural engineering. The World Trade Center towers were constructed of steel and glass. The floors were indeed concrete, but 4 inch slabs poured over steel decks. You don't have to reinforce concrete floors. The "walls" were not constructed of steel-reinforced concrete, as anybody with a modest familiarity with building materials would know; they were taped and painted drywall (Although the towers were old enough that some walls might be sheetrock). 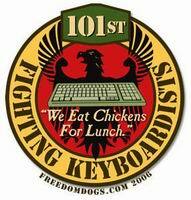 Now that's a Truth Group that might actually be deserving of the name! In a recent letter you criticized me, and Mark Roberts, for failing to notify you about questions that we had regarding your misrepresentation of a photograph of firefighters at Ground Zero searching for their fallen comrades with a flashlight. In this you expressed the hope that we would contact you in the future regarding such issues. While it is true that I had failed to contact you directly, although I am not sure how you missed this issue since it was publicized throughout the 9/11 conspiracy theory community, I had in fact contacted you on concerns I had about your misrepresentations of fact regarding other 9/11 issues previously, but you failed to respond. Not being one who likes writing e-mails for the purpose of being ignored, I stopped trying. In any case, I presume that your new request can fairly be interpreted as an offer to actually respond to inquiries, so in that spirit I am sharing other concerns that I, and other 9/11 researchers have regarding the credibility of your research, in the hopes that you might address these concerns. First of all, I would like to continue with the issue of the use of photographs. Although in the case of the aforementioned photograph of firefighters, I did not reach a conclusion as to whether the change in coloration was intentional or incidental, many assumed that it was intentional based on the fact that you have a long history of misrepresenting photographic evidence. No, I do not have such a history – but let’s look at the examples you provide, and my answers. Furthermore, there is a demonstration of a “device employing thermite” cutting through a metal rod, here. 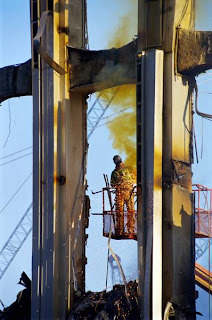 which is in fact more likely one of the hundreds of beams cut by iron workers during the cleanup, of which there are numerous photographs and examples which are similar to the one you use. An example of this may be found here. The angle-cut beam in the first photo above has been the subject of much discussion. Recently, a first-responder has stated that he saw this particular cut-column (it is rather remarkable in appearance) when he arrived at the GZ scene on 9/11/2001. We are seeking a written statement from him to this effect to hopefully settle this issue. An analysis of the slag seen clinging to the inside and the outside (both) of this angle-cut column would also do much to answer questions about what did the cutting. I think you will agree that in the second photo, the worker is using an oxyacetylene torch to cut the steel. 2. A photograph on page 17 of your paper of workers using some sort of cutting device, which apparently even you suspect it is, because you only speculate that it "may show" proof of hot metal. You give no reason why it should be assumed to be anything other than the obvious, iron workers cleaning up, given that they would have no reason to be huddled around hot glowing metal otherwise. Some other examples can be found here. Look closely: these two workers do not appear to be “using some sort of cutting device” to generate the observed bright glow in this photo. The worker on the right has both hands by his sides, and the other worker is sitting with his right hand a little in front of him. 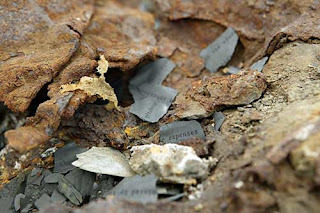 Yes, I included the caveat that this photo “may show the glow of hot metal in the rubble” [thanking you for acknowledging the caveat] since this is not totally clear from the photo, and then I added, “; the second photo clearly does so. [See Photo below in this response.] It is labeled “Red Hot Debris” and is published in LiRo News, Nov.
3. A picture of pancaked concrete floors on exhibit in an aircraft hanger, which you misrepresent as molten metal, despite the fact that the exhibit is clearly identified in resources available on the Internet, including close-up pictures showing items such as paper, which would not likely be found in molten metal. Additionally I have questions regarding the standards and practices at the Journal for 9/11 Studies, particularly the "peer-review" of your paper. You have stated on several occasions that your paper underwent another series of peer-reviews organized by your co-editor Kevin Ryan. There are two issues raised by this process. First of all, is Kevin Ryan, who to the best of my knowledge has no experience editing a scientific journal, who has never published peer-reviewed scientific research, and does not even have a graduate degree in any field, have the necessary academic qualifications and experience to carry out this process to any standard generally accepted by any serious academic body? Secondly, given the fact that you yourself founded this journal, and that you most likely also appointed Mr. Ryan to this position, after Dr. Judy Wood resigned, protesting the lack of standards at this journal, does it follow normal standards of academic ethics to have him in charge of the review process of your paper. Does the fact that Mr. Ryan himself is a major citation in your paper affect his unbiased discharge of his responsibilities? Can you point to any respected academic journal which allows this type of conflict of interests, where the founder of the journal has peer reviews for their own papers organized by people they appointed, which cites works written by that very person? Is it unreasonable for outside observers to conclude that Mr. Ryan may have a difficult time being unbiased in this matter, and conduct this process in the most rigorous manner expected under generally accepted academic standards? Given all of this, on what basis do outside observers have to place any trust whosoever in the integrity of the papers published? I find that Kevin Ryan, a chemist, is very insightful and careful in his editing practices, based on his comments now on over thirty published articles and letters in the Journal of 9/11 Studies. At the time Judy Wood resigned, I recall that she mentioned that she had done essentially nothing to that point and that time was a factor, not that she challenged the “standards at this journal.” The Editorial Board which oversees content and standards has not yet expressed concerns about the standards. The board has eleven members, seven of whom hold Ph.D. degrees, and one is a structural engineer (retired). Frank Carman (Ph.D.), Alex Floum, Prof. Marcus Ford, Derrick Grimmer (Ph.D.), Prof. Richard McGinn, Kimberly Moore, Robert Moore, Joseph Phelps (MS, PE), Prof. Diana Ralph, Lon Waters (Ph.D.) and Prof. Paul Zarembka. Based on these facts, as well as my own experience in editing scientific publications before this one and authoring or co-authoring over forty peer-reviewed publications, yes, I think that people should take the Journal articles seriously. Now even Physical Review Letters (where I have published several papers) has retractions from time to time. This may happen especially in an area of very active research such as 9/11 Studies. If there are errors, we expect the authors to point out corrections. This is expected in front-line research. In addition, my paper (an earlier version of it) was published in a volume edited by David Ray Griffin and Peter Dale Scott, 9/11 And The American Empire: Intellectuals Speak Out, Northhampton, MA: Interlink Publishing, 2006. One of the editors (Prof. Griffin) has explained that there were four reviewers for my paper, all Ph.D’s, two were physicists. Thus, the paper was peer-reviewed also under the independent editors, Prof. Griffin and Prof. Scott. Are you challenging their qualifications to supervise a suitable peer-review? Both are experienced, I think you will agree. The paper has been thoroughly peer-reviewed. Thank you for your time, and I am looking forward to your responses to these questions, so that we can clarify some of these issues. OK, where do I start? This could go on forever. First of all, his excuse that he did not receive my previous e-mail is pretty bogus, since he immediately changed the quotes I had sent him in his powerpoint presentation. Besides, how did his retirement effect his G-mail account? But that is a minor issue. As for the first question, I am a bit puzzled by his reference to the thermite cutting devices as "well known and documented". A single reference, in his own journal, 4 months AFTER publishing the paper, hardly meets accepted scientific and academic standards for sources. Has a single one of these hundreds of, what would have to be absolutely massive devices, been found in the wreckage of the World Trade Center? Why didn't his "first responder" find one tied to that column that he saw? How did the covert demolition squads get access to the columns to attach these huge devices to hundreds of columns, without anyone noticing? As regards to question 2, the answer is quite simple. Notice that they are standing on an incline. The worker to the left is considerably lower than the worker on the right. Most likely there is another worker in front of them hidden from view. You can just make out what looks like some sort of cutting torch between them. The caption for this photo, which he obtained from the BBC reads, "Investigations began as the wreckage was cleared", indicating to most people, that the workers were involved in "clearing the wreckage". Question 3 he avoids entirely, not surprisingly because it is the most damning. All he does is state that someone else took the picture. So? That does not change the fact that the picture does not represent what is claims to, and it is quite easy to find this out. He can speculate as to whether he can find his "thermite residue" on it all day, and that does not change the fact that this is not a pile of molten slag which he claimed it was. Is science now multiple choice, where you get to keep on throwing out random crap until you get something right? And for the question regarding the standards of the Journal, he also avoids the main points. Judy Wood did in fact criticize the standards of the Journal, which Jones should know, because it was mentioned in an article that Morgan Reynolds wrote specifically criticizing him. He completely avoided the question as to why an editor should be carrying out a review, of a paper written by the person who appointed him in the first place, and who contributed to the paper in the first place. The fact that Jones thinks he has done a good job is irrelevant. They all think they have done a good job, that is the point! Serious academic review is about skeptically criticizing and challenging work, not this incestous backslapping where a bunch of like-minded people congratulate each other on how brilliant they are. And posting a couple of PhDs, including a social worker and a Marxist economist, does not impress me with their academic rigour. His single "engineer" is a retiree who specialized in golf course design for God's sake! Update: Due to Blogger issues, part of Jones' response got inadvertently omitted, it has since been corrected (hopefully).